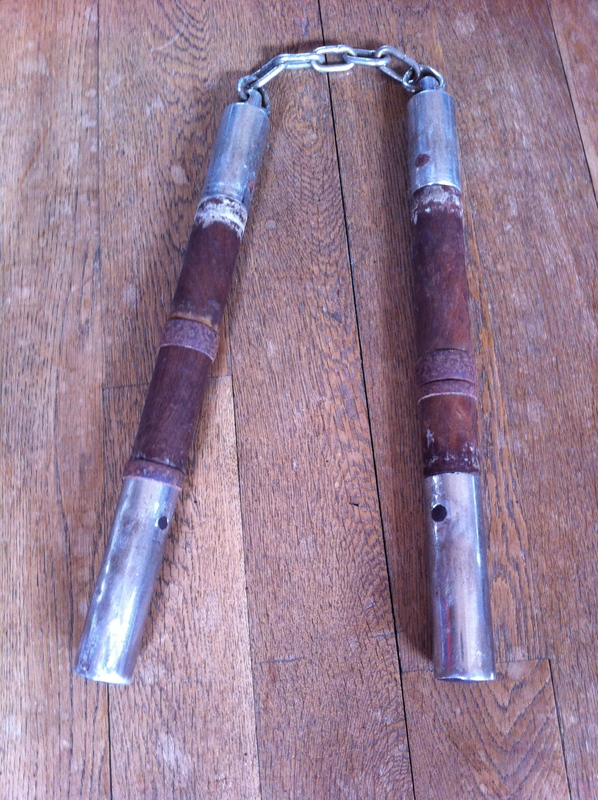 After the war, many things were either forgotten, lost, destroyed or otherwise relegated into untimely ends. Out of these ashes rose few who could take on the task of rebuilding Okinawa. Remember, many karate masters lives changed forever after the Battle of Okinawa. Okinawan Karate masters pre World War II era. 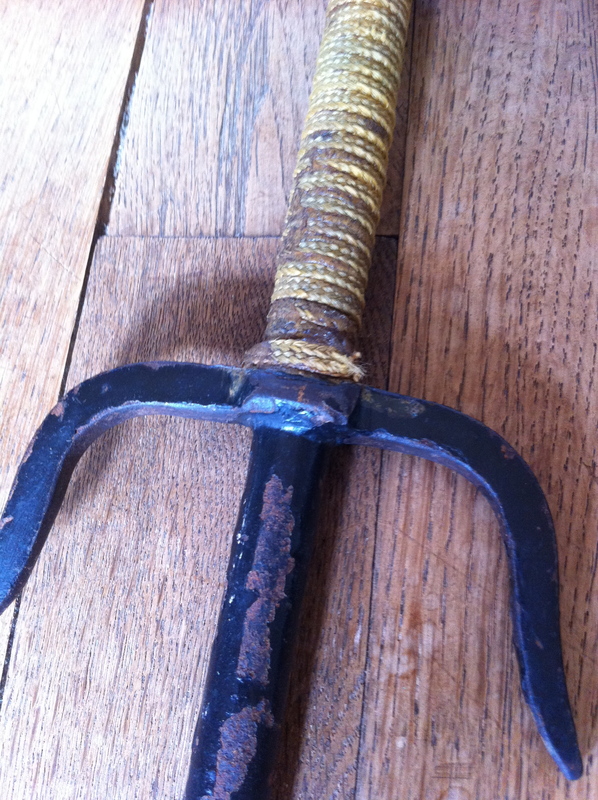 Few martial arts lineages and schools can directly trace their roots to the 1800s. More over, even fewer Okinawan Ryu Ha (school) and/or Kai Ha (a group or faction) can loosely trace their lineage 400 years further back to the 1400s. The Okinawa Kenpo line is unique to this facet of karate history. This is not an article on the history of Okinawa Kenpo, though a brief explanation is key to understand the historical significance and influence of a father and son relationship in the world of martial arts, not only as a historical study but as reflection as history that is always in the making. The names above listed are definitive for Okinawa Kenpo’s lineage cross checked by primary source documents in Okinawa as well as interviews with the late Sekichi Odo, Mitsuo Kakazu, Seiko Kinjo and Taketo Nakamura. Shigeru Nakamura (1894-1969) in addition to this lineage, was also the founder of the Okinawa Kenpo Karate Renmei, an association formed after the war to bring many karateka together to work on the improvement and testing their skills in karate-jitsu (fighting techniques) and kobujutsu (weapons fighting techniques). 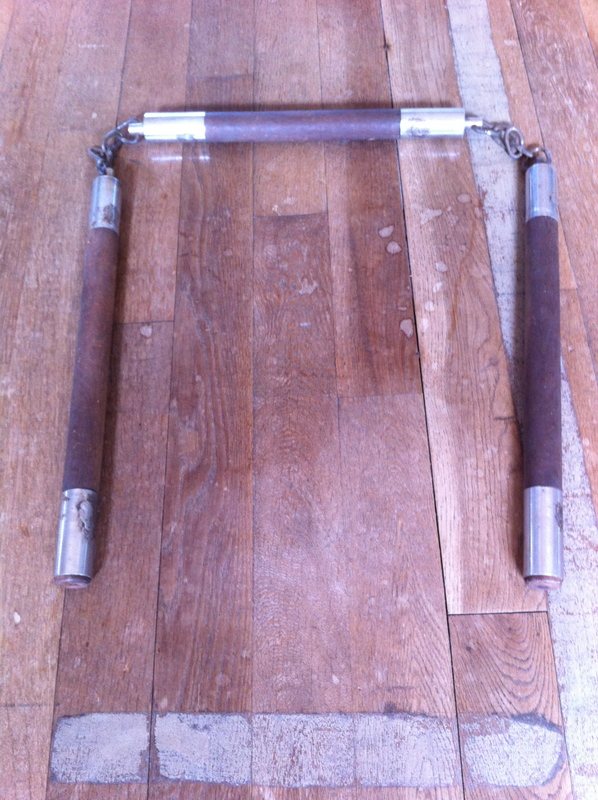 Shigeru Nakamura’s greatest contribution in the formation of the development of modern karate was the invention of the bogu-gear for free style kumite. 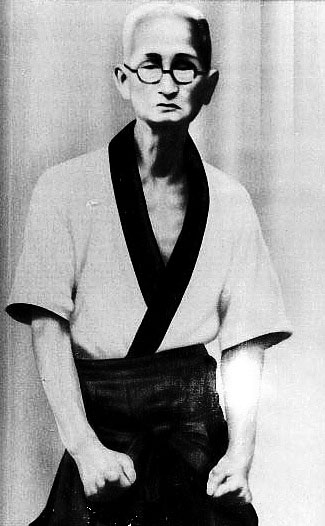 Much has been written on Shigeru Nakamura and his influence on karate. However, very little has been written about his son, Taketo Nakamura, the current Saiko-Shihan (grandmaster) of Okinawa Kenpo. 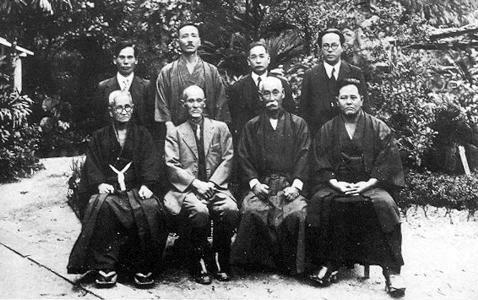 The Okinawa Kenpo Renmei became famous for several reasons, including the opening of the “largest dojo in Okinawa” at the time in 1953, in Nago, Okinawa. The chief instructor and Dojo-Cho of the Nago dojo was Shigeru Nakamura. A little known fact is that Shigeru’s son, Taketo Nakamura single handedly built the dojo. Construction of the dojo began in late 1949. With food and resources scarce, Taketo Nakamura persisted. With truly unbelievable odds and relentless determination he not only his fulfilled his father’s dream but also continued the legacy the Okinawa Kenpo lineage he had inherited. 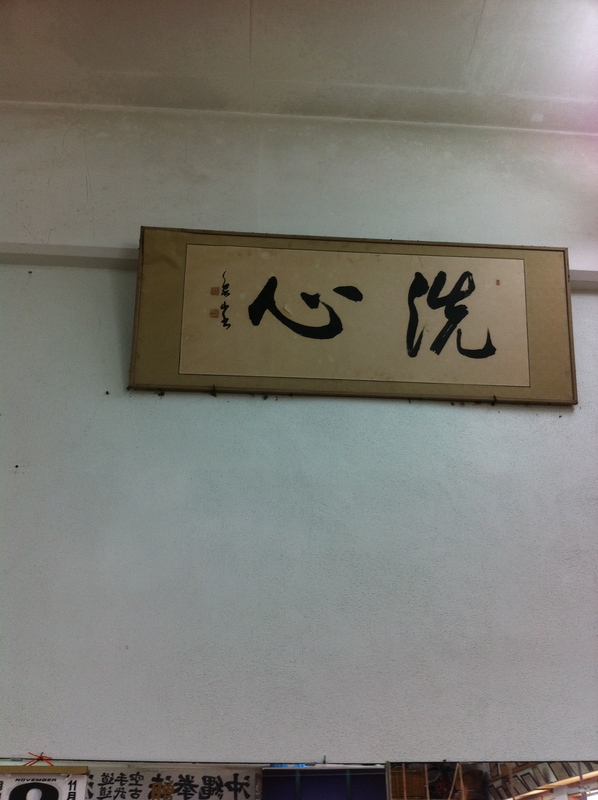 Several calligraphy pieces are mounted in the dojo including the one below, created by Ki’Chimoto, a master calligrapher and mentor of Taketo Nakamura. The “Dojo Kun” that is shown on many Okinawa Kenpo websites as well as in many loosely associated dojos and schools around the world are copies of the original penned by Taketo Nakamura. His unique position in karate was also key in his development. 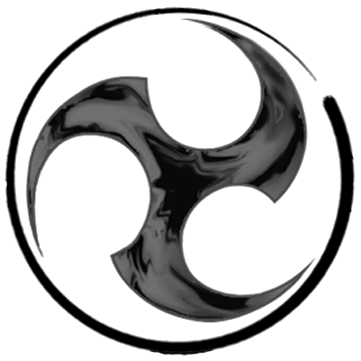 He had several kobujustu and karate masters as his mentors and sempai, due to his father’s influence and the prominence of the dojo. However, he credits his main teachers: Kokichi Nakamura (his grandfather) and Tae Ichi Nakamura, (his grand-uncle.) 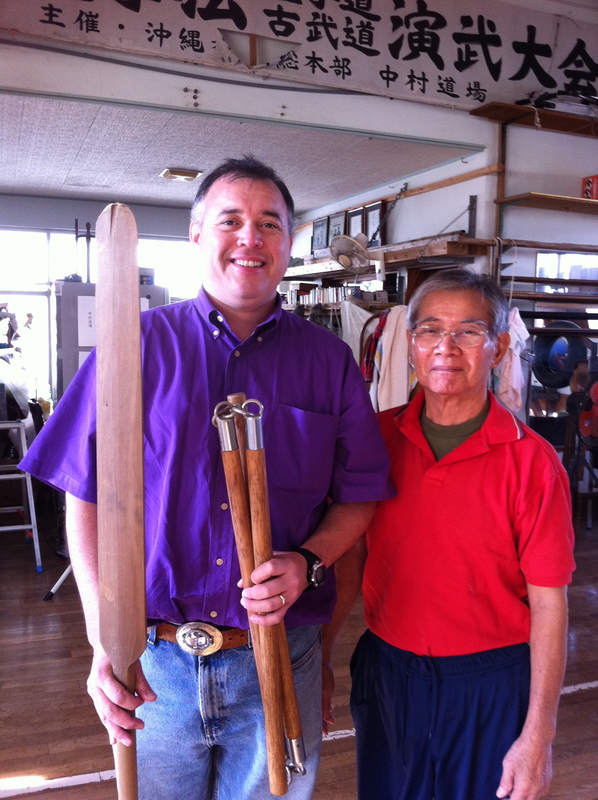 Nakamura’s expertise not only extended in craftsmanship of Kobudo, but he stood out among his peers as being a noted expert in two particular Okinawan weaponary. 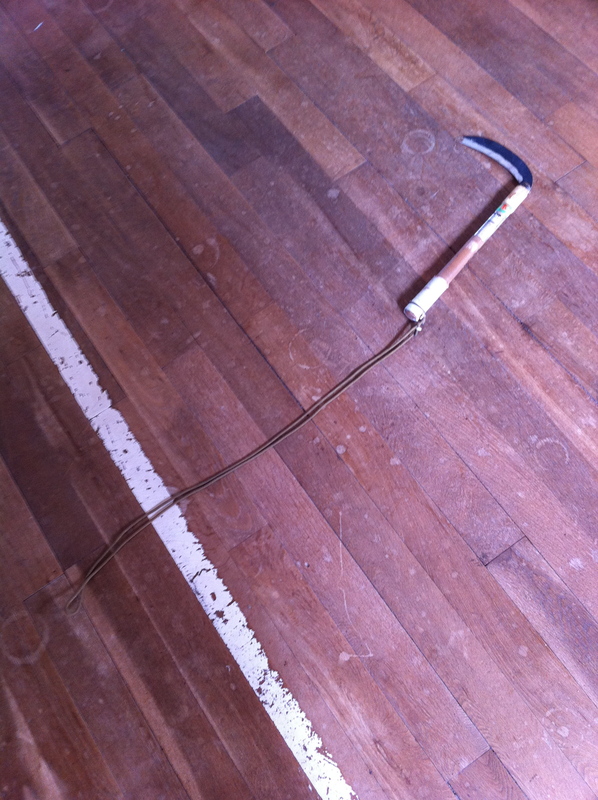 Taketo was famous in his expertise in the very rare Ryukyu Kobudo weapons form- the kusarigama (鎖鎌) – the Sickle with chain, shown in the pictures below, with modifications that Taketo designed for the usefulness of the weapon. In the 1980s, he moved on from his mechanic skill days and eventually ended up going back to school to study physiotherapy and oriental medicine. 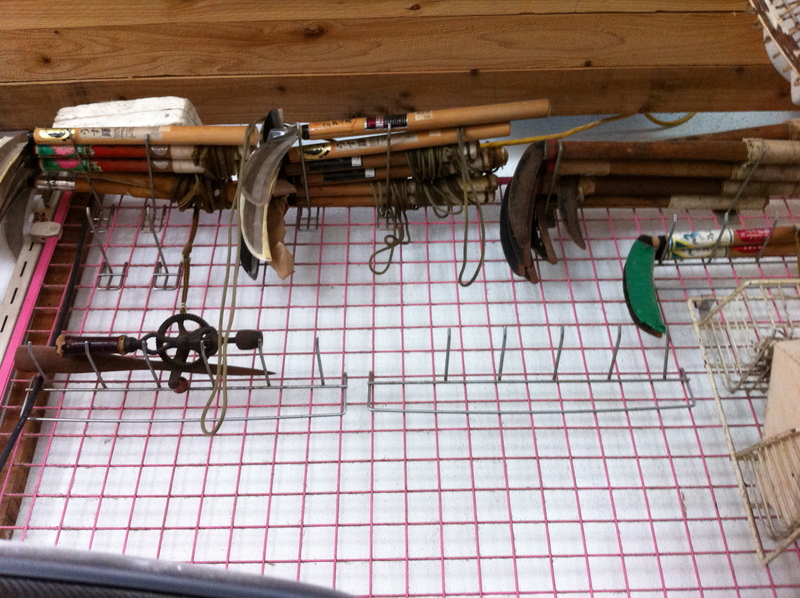 During my stay in Nago, Nakamura sensei showed me some of the model “drop tables” (for manipulation, bone setting, etc.) that he helped design. Nakamura maintained that the most important thing to keep in mind in life and the martial arts is to stay with a “Pure Spirit.” Despite many hardships and setbacks Nakamura sensei had endured, he still represents the mastery of arts both martial and medical of another era. 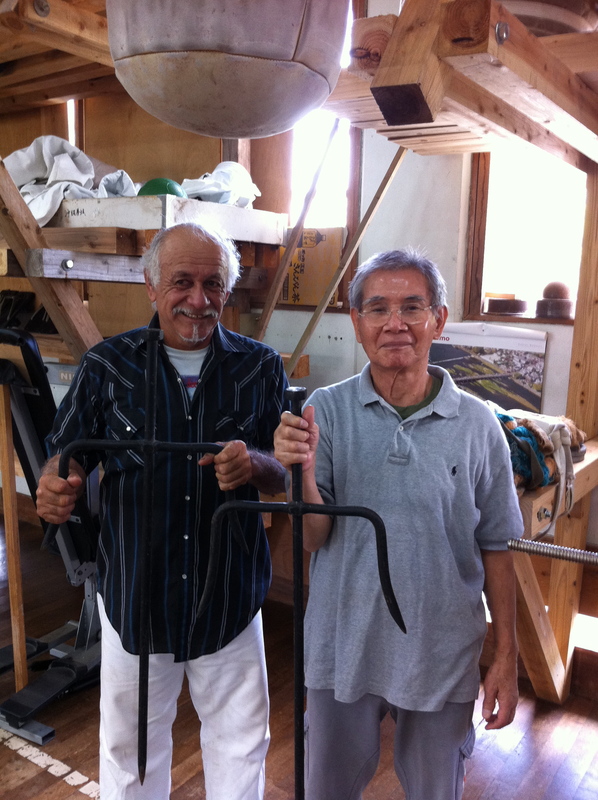 As I got up to say my good byes to Nakamura sensei, he symbolically (and literally) handed my father “the keys to the dojo,” for us to train when we were back in Okinawa. He told us, “this is my dojo please feel free to train here.” No matter how long I think I have been practicing karate (I have been practicing Okinawa Kenpo Karate Kobudo for 34 years- I began when I was 7 years old), after meeting someone like Taketo Nakamura, I realize how much I am truly just beginning to understand my way in this art. My extended thanks to Taketo Nakamura, Saiko-shihan of Okinawa Kenpo & Nick Flores, 10th Dan, in Okinawa Kenpo, for their contributions to this article. This entry was posted in Okinawa Kenpo Karate and tagged Karate, Nakamura, Okinawa Kenpo, Ryukyu Kempo, Taketo Nakamura. Bookmark the permalink. Amazing, Gonzo sensei. What an incredible story. I can’t imagine how thrilling it must’ve been to train there. Looking forward to hearing more about it from you. Very well done, glad you had a chance to share this with us! Not much is out there on Taketo so this is a valuable resource. Great article Gonzo, you look a lot taller than you did back in July of 1982!The article and pictures are great! I am sure they are just the beginning of what you and Sensei Nick have learned during your visit to Okinawa and training with Saiko Shihan Taketo Nakamura. I had the privilege to train under Taketo Nakamura, Grandmaster & Saiko Shihan, and Okinawa Kenpo Karate while stationed on Okinawa during the mid 1980’s. 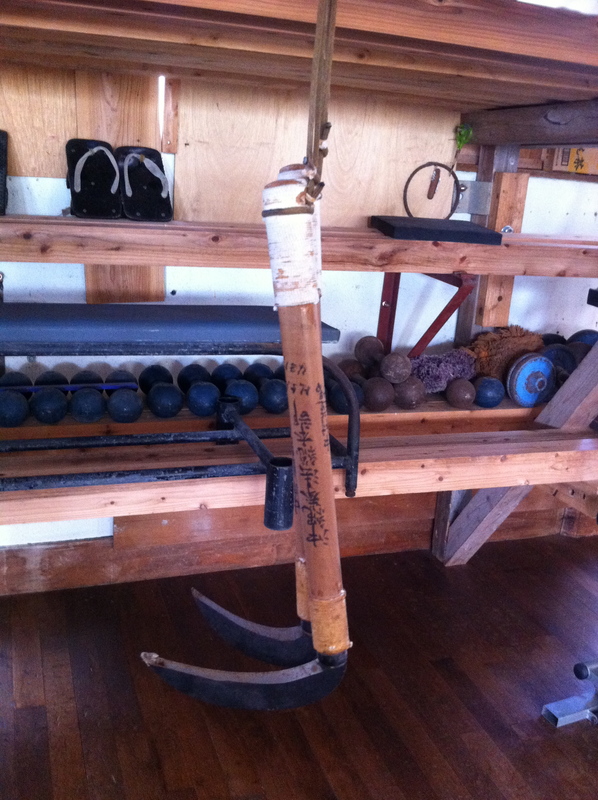 I was stationed at Camp Schwab and enjoyed going to Nago and learning Okinawa Kenpo. Sensi Nakamura always had his door open and would come down strairs to train with us. It has been many years since those great work outs in the dojo, but I remember them fondly.